Traveling to Admont on July 5, 2009. We recommend to fly to Graz and subsequently travel to Admont on Sunday, July 5. This is best done by going to Selzthal by train, and from there to take a taxi. 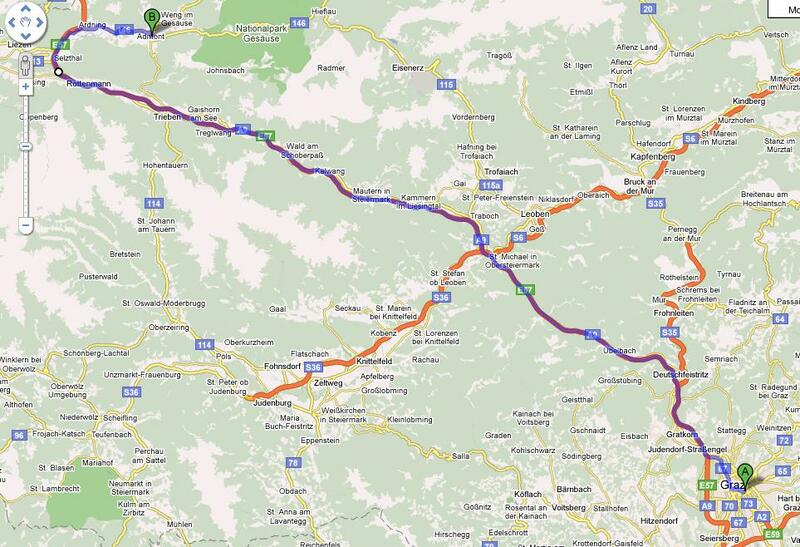 The way back to Graz is most conveniently done as the last part of the excursion. For Flights to Graz, see this web page. From the airport to the main railway station in Graz it is best to take a cab. Public transport is not very freqent and there are hardly any direct connections. A list of train connections from Graz Hauptbahnhof (main railway station) to Selzthal follows below. If you want to find your own, see Austrian Federal Railways (note the bugs in their computing the total time of a trip). A star indicates that there is a subsequent train connection to Admont, so in this case your cab ride to the conference venue is shorter. From Selzthal to Admont / Röthelstein castle it is best to take a cab, e.g. Taxi Wagner in Admont (wagner.admont@aon.at, +43 3613 2406, +43 3613 4170). Trains from Selzthal to Admont run at the following times: 09:18-09:31, 13:24-13:37, 16:26-16:41, and 17:24-17:37. Trains from Vienna to Selzthal start from the southern railway station `Wien Südbhf' (there is a bus from the airport which cost EUR 6,- last time I looked) and take at least 2 hrs 48 minutes, with a change e.g. in Bruck/Mur or in Leoben. If you really cannot fly to Graz, you can try also Linz instead. Trains need approximately one and a half hour to Selzthal. Trains from Vienna to Selzthal which take less than three hours are 08:23-11:11, 10:23-13:13, 12:23-15:11, 14:23-17:11, 16:23-19:13. Later trains are 17:44-21:35, 18:56-22:18, 19:56-23:27. Both at 16:14 and 18:48 you can board a train in the place where the excursion walk terminates (Gstatterboden) and go to Vienna in 3 hours 21 minutes, via Selzthal and Leoben.